1. Use backside of Patisserie for background. Dry brush off-white paint on cardstock. Apply rub-ons. 2. Trim lace paper into border. Apply adhesive using Xyron machine (can also use spray adhesive or glue dots). Adhere to right side of page. 3. Cut flowers out of Flea Market paper and add rhinestones or rhinestone brads to centers. Arrange on lace paper border with foam adhesive. 4. Cut mat for 5 x 7 picture. Use flower cut outs for embellishments. Adhere to top-left of page. Attach tag and title to photo. 5. Overlap smaller photos (3 x 2 ½). 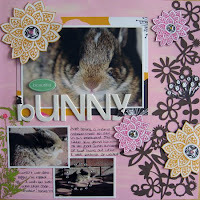 love your pages and your style, and the centers for the flowers are sooo fun!!! great job Kim, hope your dd feels better soon!! Oh my gosh, how adorable is this! I love the way you used the Queen and Co felt!